The Imaging Informatics team is (front l-r): Dr. Mohammed Elsayed, Dr. Charlotte Chung, Dr. Paty Balthazar, Dr. Nabile Safdar, Dongqing Shi, Starla Longfellow, Mercy Mutahi, Trecia Wertz. Back (l-r): Dr. Peter Harri, Dr. Maaz Maqbool, Dr. Janice Newsome, Dr. Howard Fleishon, Marijn Brummer, Dr. Adam Prater, Christopher Vant, Brenda Hall, Steve St. Louis, Denise Fennell. New uniform reporting templates rolled out departmentwide in spring 2018, thanks to leadership from the vice chairs for Imaging Informatics (Nabile Safdar, MD, MPH); Policy and Practice (Richard Duszak, Jr., MD); Clinical Affairs (Amit Saindane, MD), and Quality (Marta Heilbrun, MD, MSCI). Radiologists from all clinical divisions crafted templates for each kind of imaging study. The divisions of Emergency and Trauma Imaging, Neuroradiology, and Community Radiology Specialists collaboratively designed templates they all can use for common studies. Templates standardize both report structure—what goes where and in what order—and wording/terminology. A governance committee of faculty from all divisions and locations continually solicits feedback from radiology colleagues and referring physicians and adjusts templates to meet evolving needs. When patients access their imaging reports via the Emory Patient Portal, timeliness and readability are key. Standardization improved readability for physicians, but more work was needed to meet national patient readability guidelines. Patient Family Advisory Council member Karol Green, a communications professional as well as a patient, jumped in to help. Kadom’s team first focused on conveying good news: the radiologist sees nothing to worry about. The next challenge was simplifying wording about study findings that need follow- up but are unrelated to the reason the patient came in for the imaging study. The words also had to explain recommended next steps, and those had to be rooted in evidence-based standards. 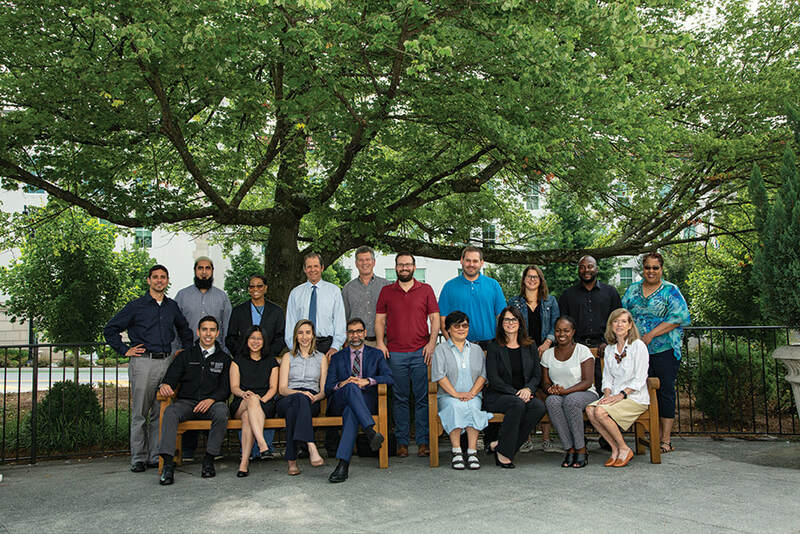 The work dovetails with the American College of Radiology’s national patient and family-centered care initiative and is partly funded by an ACR grant. The resulting templates pilot-tested well with patients and may provide best practice models for others. 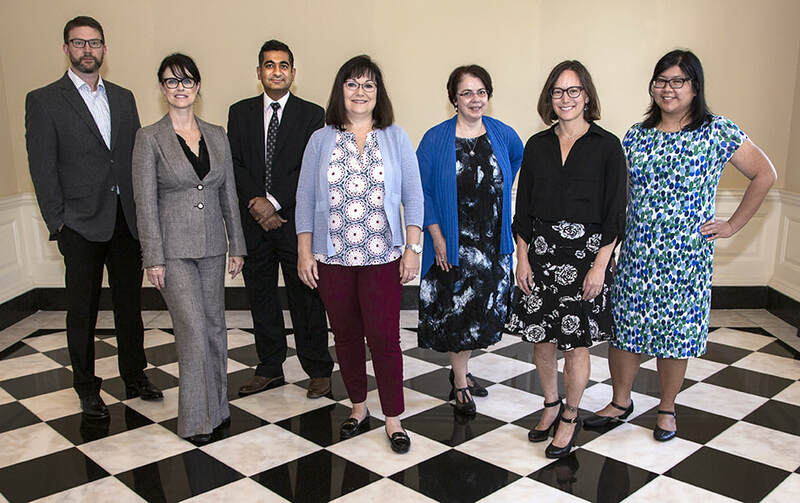 The Quality team (from left): Dr. Matt Zygmont, Starla Longfellow, Dr. Pratik Rachh, Susan Reich, Dr. Nadia Kadom, Dr. Marta Heilbrun, and Dr. Phuong-Anh Duong. The Quality and Informatics teams are implementing a new daily patient care management system as part of Emory Healthcare’s $25 million James Cox Kennedy Initiative for Patient-centered Care. They are ensuring it integrates with Radiology’s informatics systems like AirFlow, a new system for interventional radiology (IR) teams to communicate in real-time about each patient from arrival to departure. Documenting in AirFlow completion of every step in an IR procedure’s standardized protocol improves efficiency while adding safety cross-checks.